Home improvements and renovations can benefit by upgrading the windows to provide both aesthetic and functional value. According to building regulations, it is important that these structures meet with energy efficient standards and offers the added benefit of maintaining a comfortable temperature within the living environment. A closer look at double glazed windows versus single glazed windows can aid in making an informed decision to prevent heat loss and improve property value. All windows that are installed within the modern home must adhere to specific energy efficiency standards. This includes the U-value that determines the amount of heat that will escape through the material. The lower the value the better the efficiency with double glazed windows offering a greater amount of protection and insulation in comparison to the single glaze alternative. The additional glaze involves a combination of multiple panes to minimize noise pollution and energy loss through its double insulation. The inclusion of air and gas sealed between the panes offers an exceptional amount of thermal resistance that assists in reducing the amount of heat that may escape. During the colder temperatures, it serves as a suitable option to keep the immediate environment comfortable. A double glaze is advised because of the benefits that it can provide from enhanced appeal to greater levels of energy efficiency. Many home owners rely on such solutions because it decreases the use of electrical fixtures and allows one to experience a significant improvement in natural light. Replacing a single glazed window with a suitable alternative can save up to half of energy where the house has been designed with insulating properties. 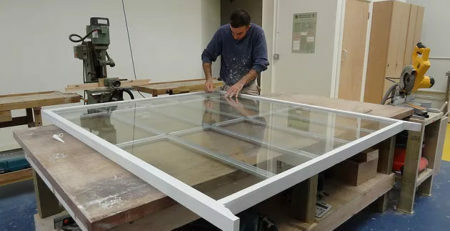 The extra glazing that is included in such developments will aid in holding heat inside the home during the winter months. There is less reliance on air conditioners and heaters as there is minimal transfer of the outside temperature through the glass panes. The doubling of glass can aid in protecting against the formation of mold and mildew that often lead to respiratory irritation and prove difficult to clean. The modification aids in developing panes that will eliminate a great deal of outside noise. For homes that are located within a busy area, it is a good idea to implement multiple glass panes compared to a single alternative because it can assist in sound reduction. Noises of a higher frequency can be better maintained as a result of the additional thickness in the glass. Additional thickness makes it more difficult to break through the glass pane. Doubling the glass serves as a more secure feature when it is compared to a single pane and may include a number of modern additions for better levels of protection. The benefits of such solutions lie in its unique design and overall composition. Most homeowners select double glazed windows because it offers a wide range of beneficial features. It includes greater levels of energy efficiency, sound insulation, and less reliance on heating systems during the winter months, allowing for savings on utility bills. Such installations provide quality, security, and improve the resale value of the home.